While the Docklands Business Awards celebrate the achievements of the current year this November’s event had a clear focus on the future. New Awards representing real forward growth for the Docklands and Irish economy were added to the list in 2018. The Smart Docklands Award was sponsored by Smart Dublin. 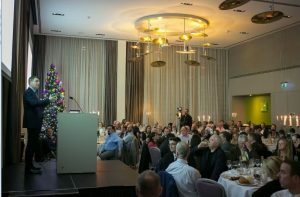 This category acknowledges the outstanding development or application of a smart technology and was won by the Civic Group for their pilot of the 1st Autonomous shuttle in Ireland. 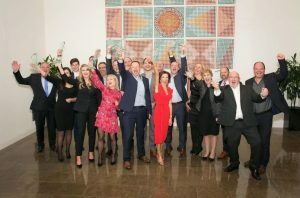 The Fintech Award, sponsored by Bank of Ireland, shines a light on a new technology or innovation competing with traditional financial methods in the delivery of financial services. The inaugural award was won by Flip-Pay for disrupting the use of legacy paywall systems within digital publishing. The Outstanding Achievement Awards was won by Neville Isdell for the remarkable reinvention of the historic CHQ Building. The Award was accepted by Neville’s behalf by his brother Mervyn Green. 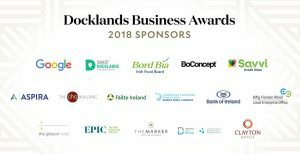 Minister for Finance Paschal Donohoe attended this year’s event and congratulated the winners and the Docklands Business Forum for all the good work they do in the area. The Top Innovator Award, sponsored by the Aspira was won by Deloitte EMEA Blockchain Lab. The Exceptional Business and Development Award, sponsored by the CHQ Building, was won by Ballymore Oxley. The Best Start Up Award, sponsored by the Local Enterprise Office at DCC, was won by Bamboo. The Lifestyle Award, sponsored by BoConcept, was won by Dogpatch Labs. The Responsible Business Award, sponsored by Dublin City Council’s Office, was won by Savvi Credit Union. The Community Award, sponsored by Savvi Credit Union, was won by Dublin City FM. The SME Award, sponsored by Google, was won by Alkamee. The Tourism Award, sponsored by Fáilte Ireland, was won by Dublin Bay Cruises. And finally, the Foodie Award, sponsored by Bord Bia, was won by Urban Brewing.